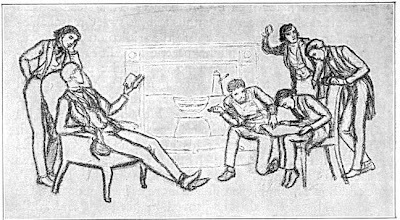 The subject of two men fighting over a woman - one that had many resonances in his own life - fascinated Rossetti from boyhood, and he returned to it in pictorial terms over many years. Virginia Surtees' catalogue lists a 'juvenile sketch' made as early as 1840, when the artist was only twelve (no. 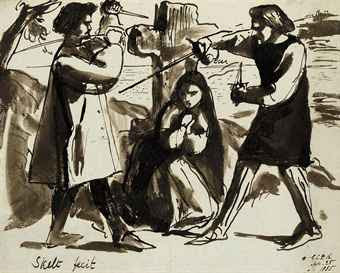 180B), and a more mature sketch in brush and indian ink which she dates to c. 1853 (no. 180A). The latter drawing is in the Birmingham Art Gallery. Please note that the sheet is inscribed 'Ophelia' in the lower right corner. Surtees, vol. 1, no. 223; vol. 2. pl. 317, as 'Wood Nymph'. 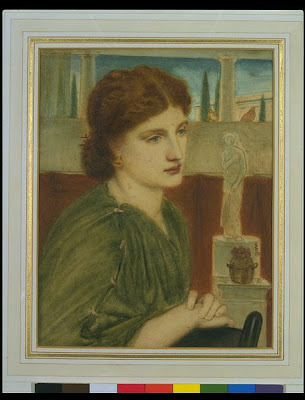 Mrs Rossetti Angeli told Virginia Surtees that she chose this drawing when, as a child, she was allowed by her father, William Michael Rossetti, to select one small drawing from those left unsold at her uncle's studio sale, held at Christie's on 12 May 1883. However, the drawing does not appear to correspond to any item in the sale, so perhaps it was not even included. The drawing shows Ophelia weaving garlands prior to her suicide by drowning. 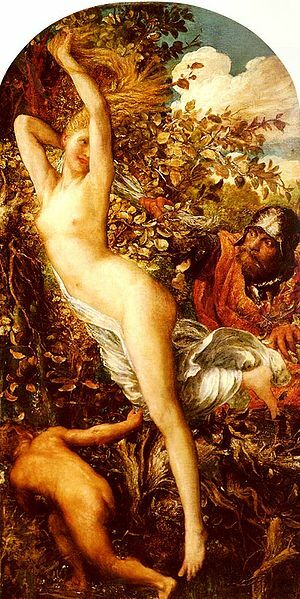 Rossetti was powerfully attracted to the story of Shakespeare's heroine. 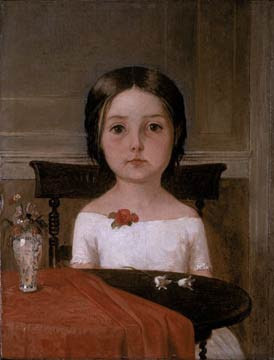 Virginia Surtees dates the present drawing to 1870-75. Many of the following pictures (Christie's Dec 2010) all belonged to William Michael Rossetti (1829-1919), the younger brother of the artist Dante Gabriel Rossetti, and have descended through his family to the present owner. Indeed two portrait drawings are by William Michael himself, and one by his wife, Lucy, the elder daughter of Ford Madox Brown. 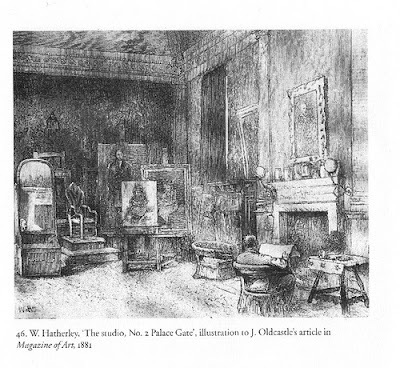 William Rothenstein, who painted William Michael's portrait (National Portrait Gallery) in 1909, recalled in his reminiscences, Men and Memories (1931), how his sitter's house in Primrose Hill, 3 St Edmund's Terrace, 'was full of paintings and drawings by Dante Gabriel and Ford Madox Brown ... he [also] had countless small drawings by his brother put away in drawers, which he would bring out from time to time'. 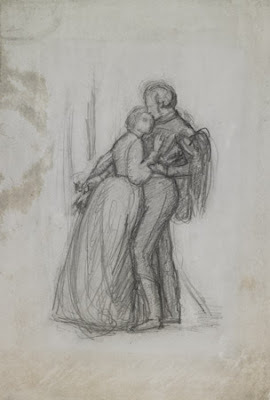 However, in a few cases the ownership of the drawings can be traced back to members of the Rossetti family from whom William Michael evidently inherited them. Lot 1, for example, was lent by his mother to Dante Gabriel's memorial exhibition at the Burlington Fine Arts Club in 1883. She also owned the strange drawing by 'Peppino' Maenza of Dante Gabriel, and both this and the even earlier portraits of the Rossetti children by Filippo Pistrucci are recorded as having belonged to Christina Rossetti after her mother's death in 1886. Lastly, the drawings by H.T. Dunn and Lizzie Siddal (lots 18-21) were undoubtedly owned by Dante Gabriel. The Dunn is almost certainly the watercolour that G.P. Boyce recorded being shown by Rossetti in November 1869, and the Siddals would have been among the works by his wife that Rossetti clung to so devotedly following her tragic death on 11 February 1862. Indeed the two most substantial drawings were possibly among the examples of her work with which he hung the drawing-room on moving to 16 Cheyne Walk the following October. We are grateful to Virginia Surtees for her help in preparing the following catalogue entries. References to 'Surtees' indicate her book The Paintings and Drawings of Dante Gabriel Rossetti: A Catalogue Raisonné, Oxford, 1971. 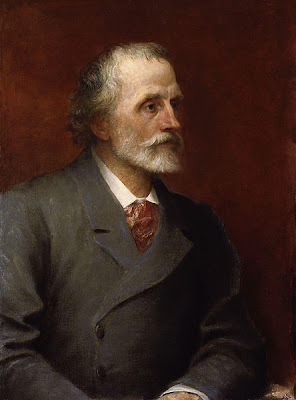 William Michael Rossetti (1829-1919) was Dante Gabriel's slightly younger brother. Though a civil servant by profession, he was a member of the Pre-Raphaelite Brotherhood, formed in 1848, edited its short-lived journal, The Germ, and remained closely connected with the movement as eye-witness and analyst. 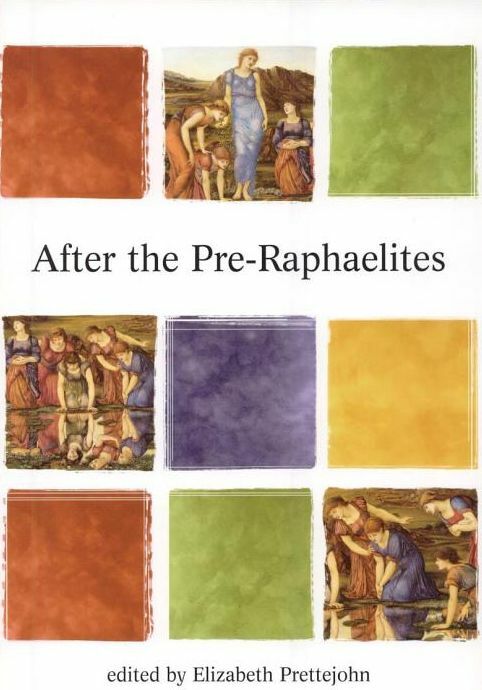 Indeed, without his indefatigable chronicling, our knowledge of Pre-Raphaelitism in general, and the Rossetti family in particular, would be infinitely the poorer. 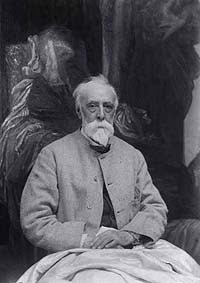 As a prolific art-critic, editor and literary historian, William Michael also made a significant contribution to the wider culture of his time. Oscar Wilde paid tribute to his 'great literary influence and eloquent pen'. 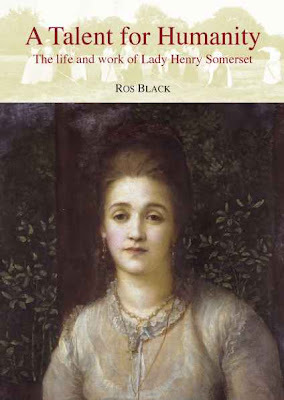 The writer and his wife Lucy, the elder daughter of Ford Madox Brown, have been the subject of a recent biography by Angela Thirlwell (William and Lucy: The Other Rossettis, Yale, 2003). 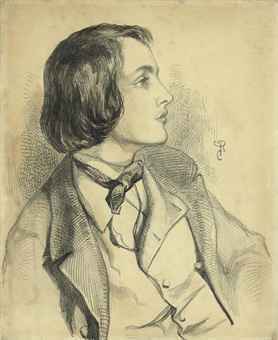 This fine drawing is undated but Marillier, followed by Virginia Surtees, assigned it to 1846, two years before the formation of the Pre-Raphaelite Brotherhood, when the sitter was seventeen. It shows the influence of Gavarni and other French illustrators on the artist at this time. 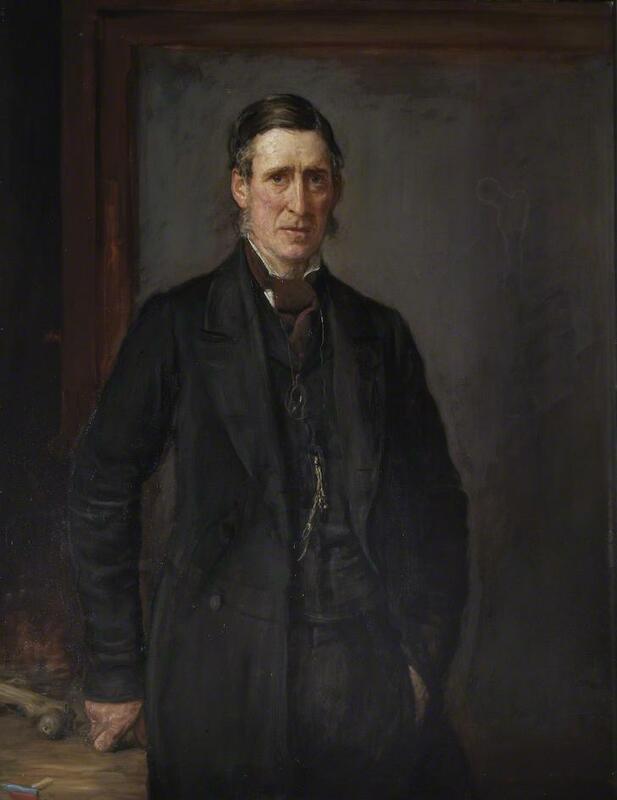 H. R. Barraud - John Ruskin 1882/3? Photograph taken on the grounds of Brantwood, Ruskin's home on Lake Coniston. Burne-Jones has dedicated the drawing to HW. This almost certainly refers to a private joke, a nick-name for Elizabeth Lewis. 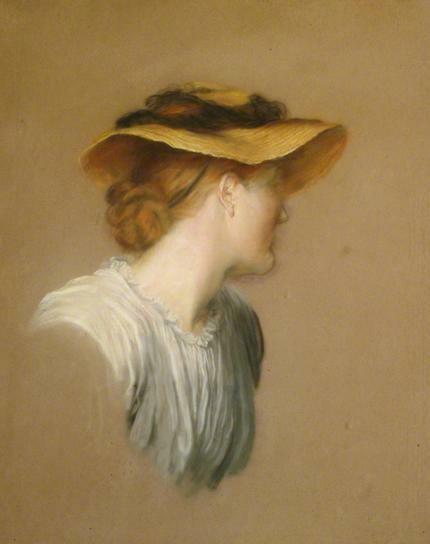 As in a number of his private works, the composition of this portrait of 1881 has no equal in the Victorian age. 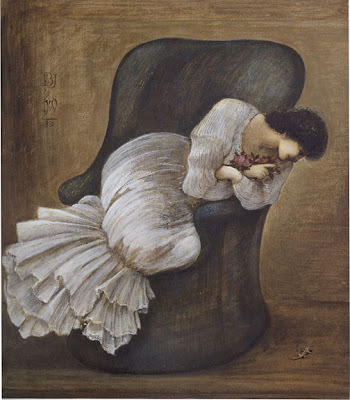 It is reminiscent to our eyes of a composition from Northern Europe at the beginning of the twentieth century When not creating works to go in front of the public, Burne-Jones allows his natural inclination to innovation to roam free. The two families often stayed together in the Lewis's country house, Ashley Cottage at Walton-on-Thames, Here, Burne-Jones entertained friends with his whimsical drawings and caricatures. 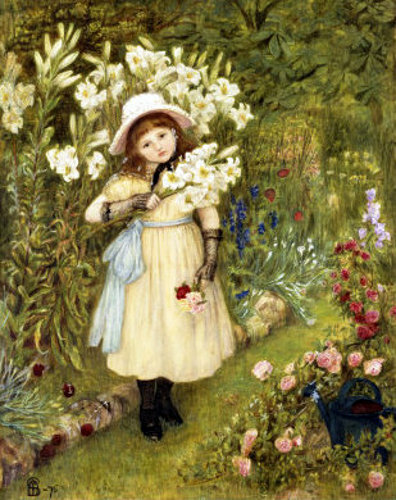 Elizabeth Lewis was very much town-bred and the summers that she spent there were her first tastes of country life. Insects and creepy crawlies intimidated her and naturally, Burrie-Jones, with his wicked sense of humour, found this an extreme source of amusement. He depicts his hostess perched on a chair, peering fearfully down at a tiny lizard. Lady Lewis gave this very personal portrait to Ilona Eibenschutz, one of the most talented pianists in Europe. Ilona graduated from the Vienna Conservatory at the age of twelve and as a child impressed some ofthe most illustrious musicians of the day, including Mahler, Liszt, Verdi and Anton Rubinstein. When she first arrived in London, Lady Lewis became her chaperon. She was soon to be married to Carl Berenburg and afterward abandoned her career, only performing in private before Lady Lewis and her circle. This is one of Lady Hawarden’s most interesting ‘Photographic Studies’ or ‘Studies from Life’, as she titled her photographs. Her two eldest daughters are shown seated in the family home, one reading and the other sewing. On the wall above the fireplace is an array of framed etchings by Francis Seymour Haden. Haden was the family physician and was also related to the painter James McNeill Whistler. He based a number of etchings on photographs by Hawarden. Above the group of framed pictures is a photograph by Oscar Rejlander, ‘After Raphael’s Sistine Madonna’. In it, two children re-enact the composition of Raphael’s famous painting of the Virgin Mary and the Christ Child, which is now in Dresden. Rejlander wrote an obituary of Hawarden after her death in 1864. His pioneering creative work during the 1850s is likely to have encouraged Hawarden’s own experiments. 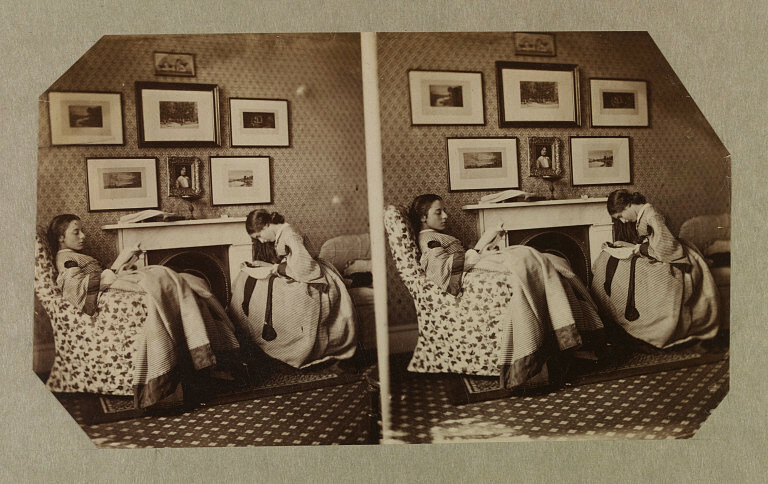 The photograph documents a domestic moment but also records significant aspects of Hawarden’s artistic environment. Viewed through a stereoscope, this stereograph would have yielded clear and detailed images of the pictures on the wall. This photograph is the only known surviving print of this image, made by one the pioneers of early fine art photography. 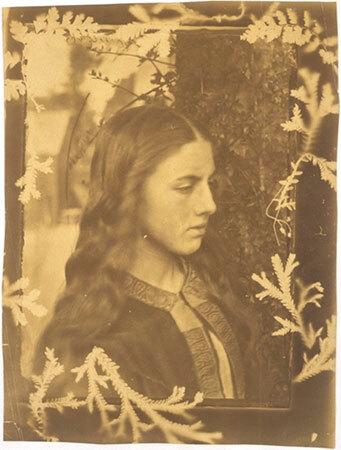 Clementina, Lady Hawarden (1822-1865) entitled her works simply Photographic Study or Study from Life. 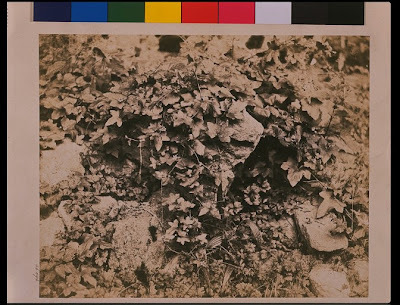 Hawarden used seven different cameras in her work, culminating in one which took plates of approximately 10x10 inch format. The photographs are albumen prints (light sensitive silver salts in an emulsion of egg white) printed from wet collodion (gun-cotton in ether) on glass negatives. A wet collodion negative consists of a sheet of glass hard-coated with a thin film. 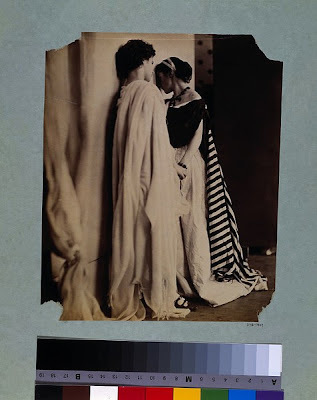 Hawarden's photographs were probably pasted into albums and torn out before entering the Museum's collections. This is why many of the corners of the pictures are irregular and torn. Hawarden's favoured subjects were her children, two of her daughters in particular. The Museum has 775 photographs by Hawarden in its collection all from the donation given in 1939 by her descendant, Lady Clementina Tottenham. In 1859 Hawarden established a studio and darkroom on the first floor of her newly-built London house at 5 Princes Gardens (now demolished). 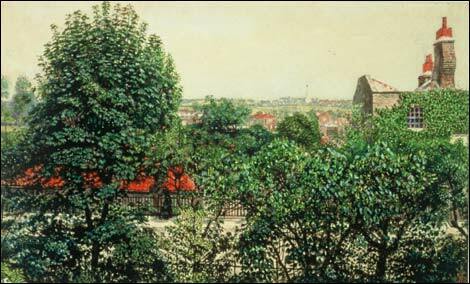 It was a few hundred yards north of the South Kensington (later Victoria and Albert) Museum. 50 x 64cm (19 11/16 x 25 3/16in). The historic town of Hastings was painted by many Victorian artists. 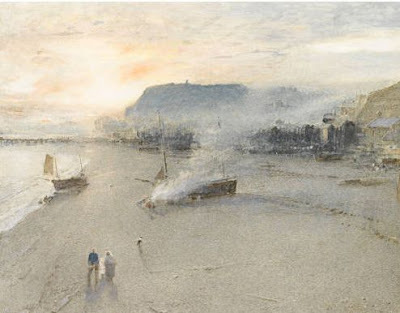 Goodwin chose to paint the scene at sunset very much in the style of Turner, the artist he admired most. Goodwin worked both in oil and watercolour, but it was his watercolour technique which was particularly highly regarded for its poetic style and experimentation. In this work, both watercolour and gouache are used in a variety of techniques that include blotting, sponging and scraping. 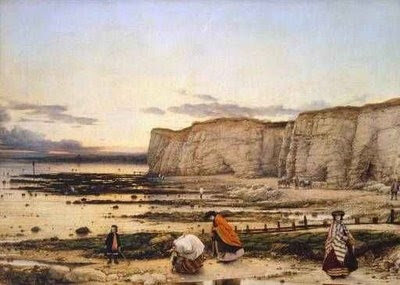 In later life, Goodwin developed the use of pen-line on top of watercolour as well as more extensive stippling. He modeled landscapes with sponges of colours and lower tones, creating large expanses of abstract colours adding later detail to delineate the scenery. 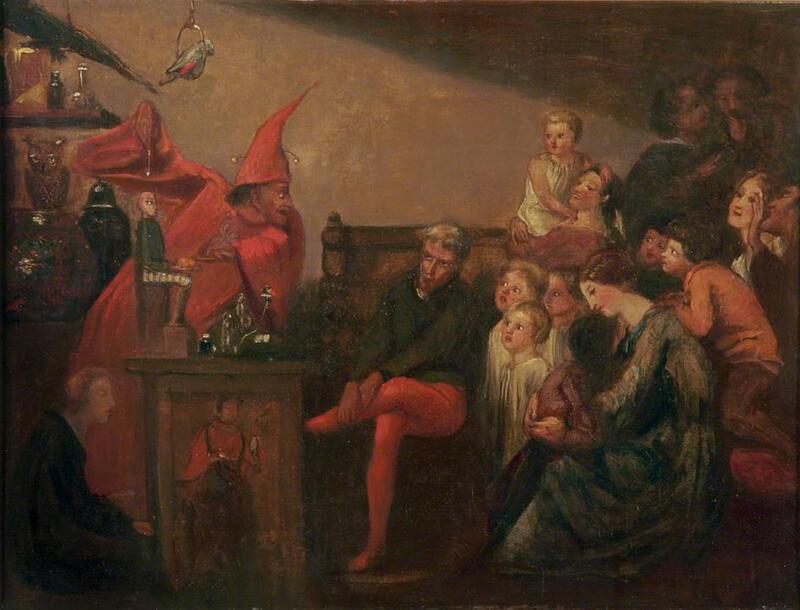 Goodwin focused on light and atmosphere in his works, as can be seen in this painting. His use of grey emphasizes the reds, oranges and yellows, creating a stunning sunset. 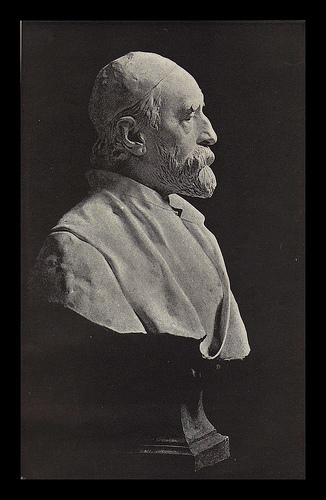 Martin Hardie wrote of Goodwin that "he can be counted as one of those who have successfully dealt with twilight and sunset." 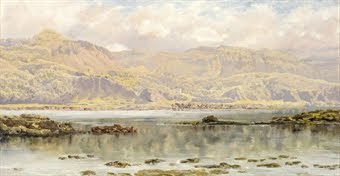 Goodwin first exhibited at the Royal Academy in 1860 at the age of 15 and he became a highly regarded member of the Royal Watercolour Society. He is best known for his landscapes but he also painted biblical, allegorical and imaginative subjects. 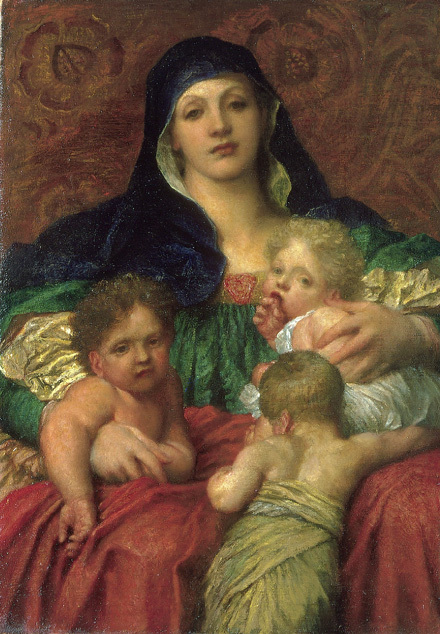 He studied under Arthur Hughes and Ford Madox Brown who were leading members of the Pre-Raphaelite brotherhood and inspired much of his early work, although their influence waned after the 1880s. 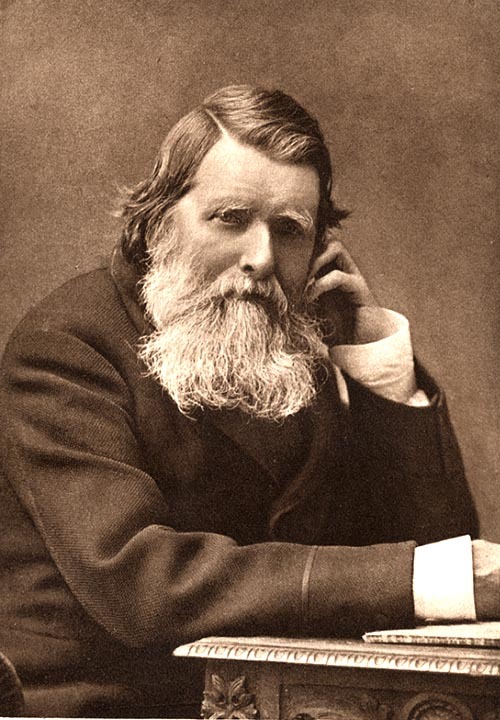 John Ruskin was also a mentor and friend and the two travelled together extensively throughout Europe which, along with Goodwin's other prolific travels, inspired many of his works. 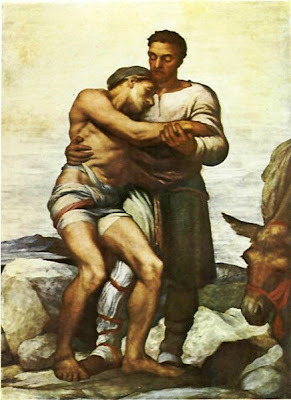 He considered painting a religious act, stating "for is he not one who is helping to open the eyes of the blind that they see the hand of our Heavenly Father in the things that he has made for our delight?" A contemporary reviewer once wrote that "he stands quite alone in his power of imparting a touch of fairy influence to his landscapes" and another wrote "he is almost the only one whom landscape receives any touch of ideal quality. 11.5 x 16.5cm (4 1/2 x 6 1/2in). This drawing is datable to the years 1869-70 when Burne-Jone's work shows close parallels with that of William Morris. 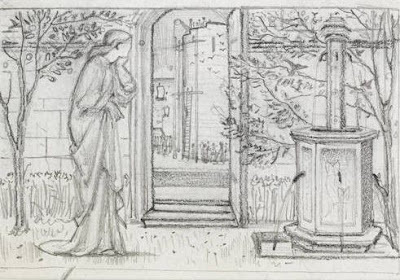 One of their planned joint ventures was that Burne-Jones should produce a series of designs to illustrate Morris's cycle of narrative poems The Earthly Paradise published between 1865 and 1870. Although the scheme was abandoned, stories such as Danae, Cupid and Psyche and Pygmalion which found poetic form in the Earthly Paradise provided Burne-Jones with pictorial inspiration from the late 1860's till the end of his life. 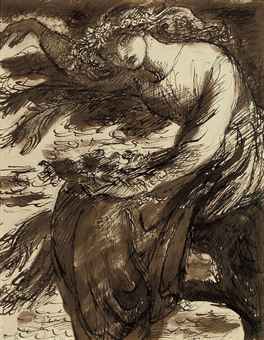 This drawing may be a projected design for one of the Earthly Paradise illustrations since the composition is framed by pencil lines and is of the same size as the artist's pencil designs on tracing paper for his Cupid and Psyche illustrations of the same series. The subject of this drawing was certainly treated by the artist in three famous paintings, the earliest of which was dated from around 1869 is in the Ashmolean Museum, Oxford. 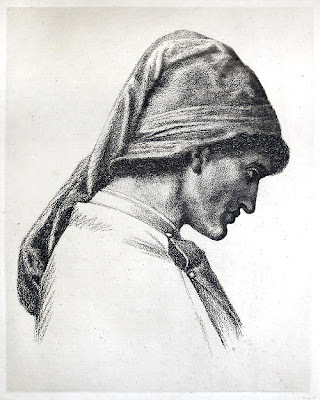 Although the composition of the Ashmolean pictures is an upright one, the pose of Danae who anxiously watches the building of the tower through a doorway, is the same as in [this drawing; the background however is far less finished. Another version of Danae and the brazen tower is in the Fogg Art Museum while the final most finished version is in Glasgow Art Gallery. According to the legend, Acrisius, king of Argos, was warned by an oracle that the son borne by his daughter Danae, would kill him. 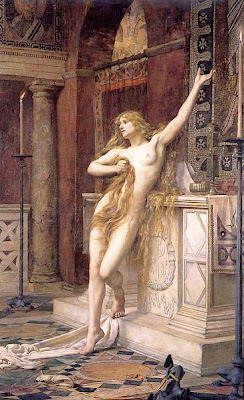 He gave orders for her to be imprisoned in a brazen tower where in spite of the impenetrable walls, Zeus appeared in a shower of golden rain and seduced her. She bore him a son, the famous hero Perseus. 154 x 91cm (60 5/8 x 35 13/16in). A young woman in a nightgown, her hair down and her feet bare, sleepwalks along the top of a cliff, perilously close to the edge. She carries a brass candlestick in which the candle has just gone out, making the scene even darker and more nerve-wracking, than it was a moment ago. Now her path is lit only by moonlight. She moves forward unaware of the danger, on her face the fixed, wide-eyed stare of the somnambulist. 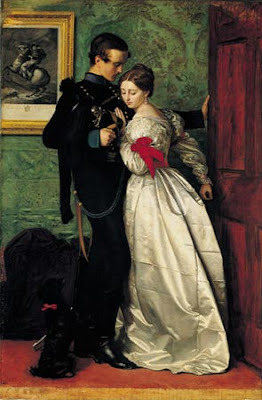 Many of Millais's paintings show moments of drama but this scene, in which certain death is literally just a step away, is unusually immediate and intense. In all likelihood he derived the subject from the plot of an opera, Bellini's La Sonnambula, a complicated romantic tale set in a village in Switzerland. In the opera's final scene the heroine, Amina, sleepwalks across a high and dangerously unstable mill bridge, grief-stricken at being unjustly rebuffed by Elvino, to whom she is betrothed. It was a previous episode of sleepwalking that caused the misunderstanding between the lovers, Amina having wandered into the room of another man, Count Rodolfo, at the village inn. In the climax, Amina reaches the other side of the mill bridge safely and awakens in the arms of Elvino, who now realizes that she is blameless. It would be nothing new for Millais to draw upon such a source for the basic scenario of a painting. He was a music enthusiast who counted among his friends some of the leading composers and performers of his day, including Arthur Sullivan. 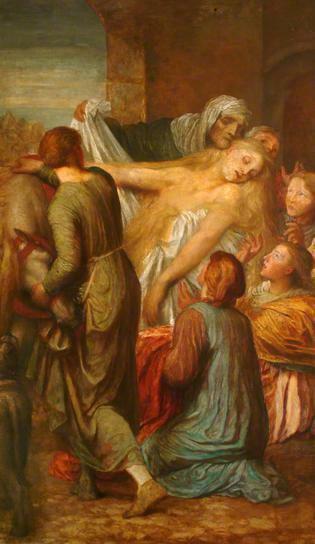 He loved the opera and had used operatic plots – a more original choice than, say, the scenes from Shakespeare that were such a staple of Victorian painting -- for the subjects of some of his minutely detailed Pre-Raphaelite paintings of the 1850s: A Huguenot is based on Meyerbeer's Les Huguenots; The Proscribed Royalist, 1651 on Bellini's I Puritani; and L'Enfant du Régiment on Donizetti's La Figlia del Reggimento. As Alison Smith pointed out in the catalogue of the Millais exhibition of 2007-2008, the figure in A Somnambulist recalls J. A. M. Whistler's Symphony in White, No. 1: The White Girl (National Gallery of Art, Washington). Among Millais's artist contemporaries, there was none whose career he followed with a keener eye, or whose work he acknowledged more openly in his own, than Whistler. He especially admired The White Girl. As Whistler's model for the painting, Joanna Heffernan, wrote in a letter: "Some stupid painters don't understand it at all while Millais for instance thinks it spleandid [sic] more like Titian and those old swells than anything he [h]as seen." Millais had already painted an artistic response to The White Girl in the form of a portrait, his Nina Lehmann of 1868-69. A Somnambulist represents a similar kind of homage to Whistler, this time in narrative mode. It is an homage that contains an element of correction, however. Though appreciating the beauty of Whistler's color and brushwork, Millais replaced the uncomfortable suggestions of a sexual encounter in the American artist's painting with a more straightforward, in a sense a more English, kind of narrative. 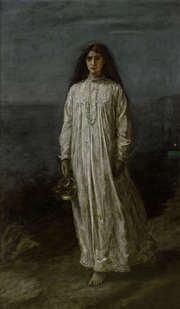 It is as though he was attracted to the strangely staring female face in The White Girl and countless other paintings by Whistler and his fellow painters of the Aesthetic Movement, but when it came to making his own white girl he preferred to give the strange stare an explanation – somnambulism, that anyone could understand. Millais may have based the coastal view in the background on the cliffs near Budleigh Salterton in Devon, where he made sketches in May-June 1869 in preparation for his painting of The Boyhood of Raleigh. Landscape was very much on his mind at this time. A Somnambulist was to make its debut in 1871, at the same Royal Academy exhibition as Chill October, the first of the large, bleak landscapes that were to punctuate the rest of his career. Alison Smith suggests that the landscape background of A Somnambulist may be another instance of Millais paying homage to Whistler, in particular to the series of night scenes he called Nocturnes. This may be the case, although Whistler had only recently begun the series and there is no certainty that Millais would yet have seen any of them. At the time he painted A Somnambulist, Millais was 41 years old and at the height of his powers. He was popular with the public and collectors alike, prosperous, and moving in prestigious circles. On March 30, 1871, when A Somnambulist was probably still on the easel, he received the Prince and Princess of Wales on a visit to his studio. No doubt he would have shown them all the paintings he was preparing for the Royal Academy exhibition that year: A Somnambulist and Chill October; a modern-life love drama entitled Yes or No? ; a large biblical subject, Victory O Lord! ; and a portrait of the classical historian George Grote. 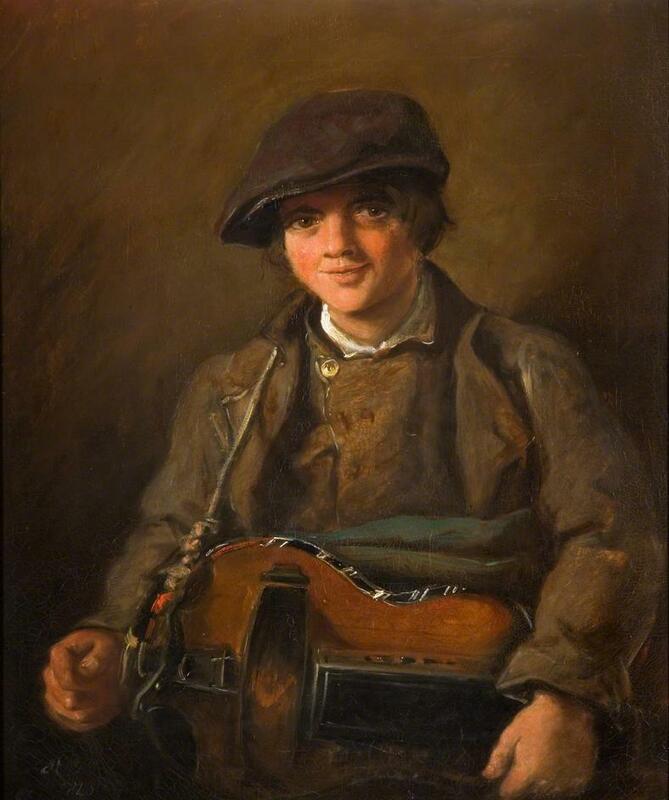 His range of subject-matter was remarkable, and yet "a Millais" was instantly recognizable from its broad, Old-Masterly technique, so different from the meticulous fact-recording of his earlier, Pre-Raphaelite style. On May 13, 1871, Vanity Fair published a caricature of him entitled A converted pre-Raphaelite. Today A Somnambulist strikes a fascinating modern chord, especially considering the interest in altered states of consciousness among later artists such as Edvard Munch or the Surrealists. In Victorian England, some people worried that there was something unworthy, maybe even unseemly, about the very subject of a woman dressed for bed. The critics picked up on this, but admired the work nonetheless. "The realism of the night-dress and candlestick affords an easy theme for carping," wrote The Times. "But it is impossible to contest the grace of the figure or the power with which the painter has given the effect of eyes still wide open, though not seeing, and the effect of moonlight and scattered coast lights" (29 April 1871, p. 12). 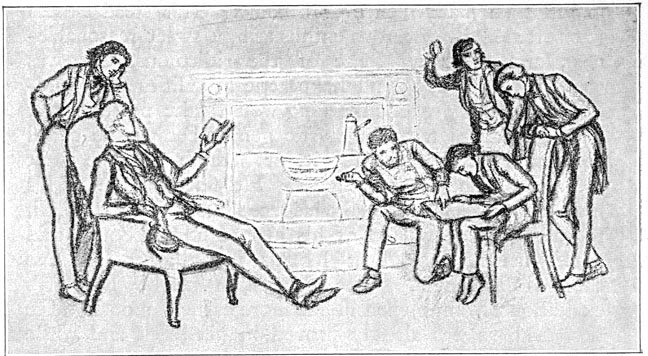 Writing in the Athenaeum, Millais's old Pre-Raphaelite comrade-in-arms F. G. Stephens was similarly won over despite himself: "As a subject, this is, of course, much below the painter's powers; yet so fine is its execution, so admirable is the expression, so pathetic, as indeed the artist could not avoid making it, so complete is the depicting of Nature, and so eminently dramatic, however melo-dramatic, is the conception of the whole, that while we are hesitating to approve the picture, its charms steal our verdict" (29 April 1871, p. 531). We are grateful to Malcolm Warner for his assistance in cataloguing this lot. "Lady Henry Somerset (Isabel) was the eldest daughter of Charles, 3rd Earl Somers and his wife, Virginia. Virginia was 1 of the 7 Pattle sisters who all made their mark in Victorian society. Another Pattle sister was Julia Margaret Cameron, who became a reknown photographer. " Its been one thing then another. I was re-cabling my router, after moving my computer, and something broke and my local town didn't have the correct cable. All ordered but be back properly later this week. We are grateful to Charles Brett for his help in preparing this catalogue entry. 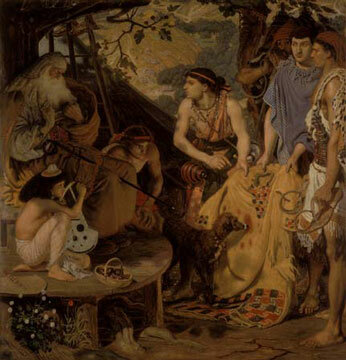 In 1874, Cameron's neighbor, and renowned poet, Alfred Tennyson suggested that Cameron create some illustrations for a new volume of his series of poems on Arthurian legends, "Idylls of the King." In the end, only three images were used, as woodcuts, but the full-size prints were later published in two volumes and were reproduced lithographically accompanied by excerpts from Tennyson's text and his signature. The biographies of the sitters Mr. Read and Mrs. Hardinge are unknown. Julia Margaret Cameron was born in Calcutta in 1815. Her father, James Pattle, was an official with the East India Company and her mother, Adelaine de l'Etang, was of French aristocratic descent. Julia was the fourth of seven sisters and received much of her education in France and England before returning to Calcutta in 1834. In 1836-37 she travelled to Cape Town where she met the notable scientist and astronomer Sir John Herschel. Herschel was to become a life-long friend and supporter of her work. He was probably the first to introduce her to photographic processes and is the subject of some of her best known portraits. In 1837 she met Charles Hay Cameron, whom she married in Calcutta in 1838. He was an important figure in law reform and education in India, and twenty years her senior. For the next ten years the Camerons lived in India and were highly regarded and active in colonial politics and society. 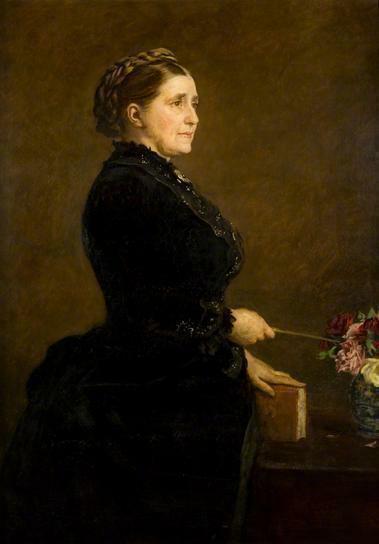 Mrs Cameron was kept busy as hostess, manager of the household and as a mother. Several of the Pattle sisters (renowned for their beauty and charm) had married and settled in London and the Camerons' two eldest children Julia and Eugene were sent to England to be educated. 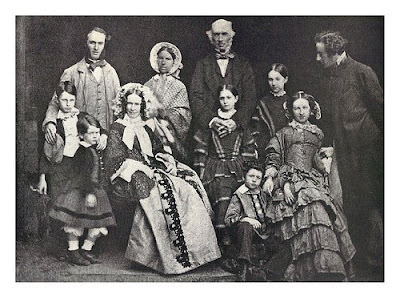 When Charles Cameron retired from colonial service in 1848, the rest of the family returned to England to live. Initially settling in Kent, they made the acquaintance of the author Sir Henry Taylor (who was a neighbour) and through him Alfred Tennyson. 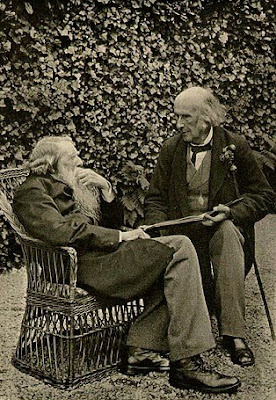 Like Herschel, both Taylor and Tennyson would remain life-long friends, public supporters and frequently photographed subjects of Mrs Cameron. The Camerons were soon frequenting the home of Julia's sister Sarah Prinsep who set up a salon at Little Holland House in Kensington, London. 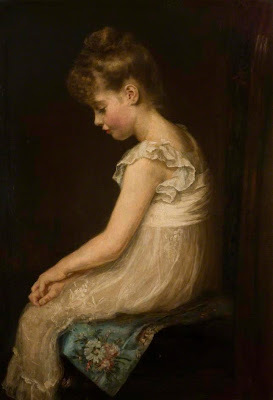 It was here that Mrs Cameron kept company with an important network of literary and artistic figures including G. F. Watts, William Holman Hunt, Tennyson, Robert Browning and Henry Cole, the founding director of the South Kensington Museum, now the Victoria and Albert Museum. As Little Holland House had been before it, Freshwater became something of a salon, with a host of artists, writers, and intellectuals gathering at the Tennyson and the Cameron residences on the island. The photographer Reginald Southey visited in 1857, Charles Dodson (Lewis Carroll) in 1862 and Oscar Rejlander in 1863, photographing both families and probably instructing and collaborating on compositions with Mrs Cameron. 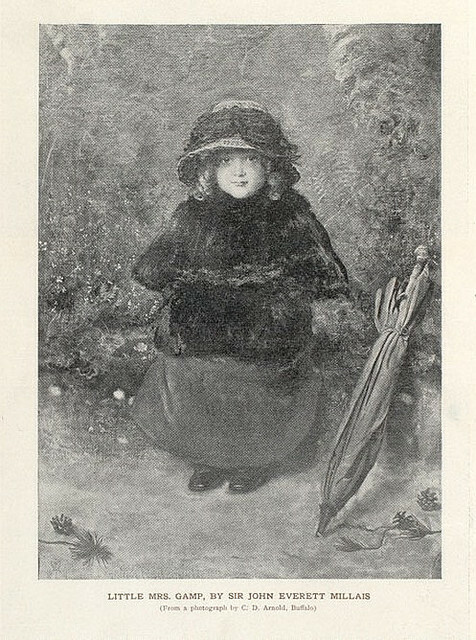 In her fifteen years of work after the acquisition of her own camera, it was with her friends from these circles at Little Holland House and Freshwater- the painter David Wynfield Wilkie, Watts, Tennyson, Herschel, Taylor and Cole- that she would discuss practical and artistic matters about furthering her photographic career. It was at Dimbola in December 1863, that Cameron, then aged forty-eight, was given a camera by her eldest daughter Julia and husband Charles Norman. Before actually owning what was an expensive and cumbersome piece of equipment, Mrs Cameron had been involved in various aspects of the photographic process - printing negatives and photograms, compiling albums as gifts, posing for photographs and helping to stage compositions. The gift marks the beginning of what would quickly become her all- encompassing application to the "art" of photography. 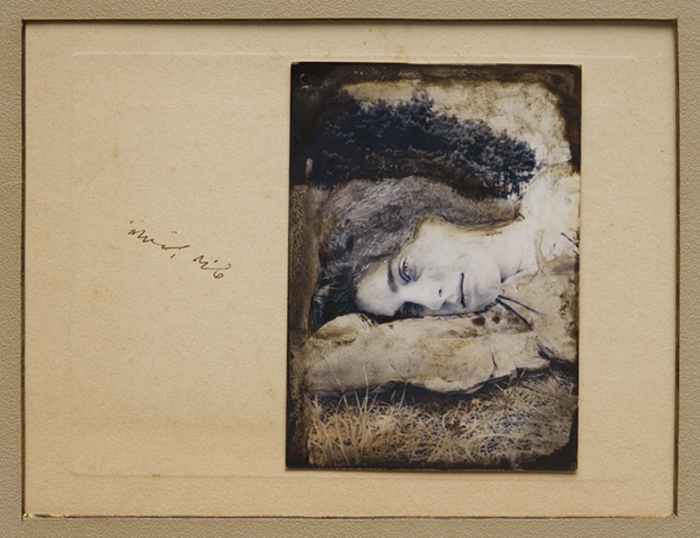 Setting up the coal store as a dark-room and the glass-enclosed chicken house as a studio, she began her single handed photographic investigations fervently, annotating a portrait study of Annie Philpot "my first success" a month later in January 1864. From this time Cameron worked tirelessly - photographing and composing subjects, producing prints, and promoting and distributing her works as widely as possible. She assembled albums which she gave to her supporters and friends, initiated acquisitions of her work by the British Museum and the South Kensington Museum and entered into formal business arrangements to have her more popular images reproduced as carbon prints. She immediately began to register her images at the British Copyright Office, became a member of the Photographic Societies of London and Scotland and started to exhibit and sell her work. In 1865 she established the print dealers Colnaghi in London as her agent. Cameron's techniques (sometimes consciously leaving prints with smudges, printing from cracked negatives and scratching away the emulsion of negatives), and the "out of focus" look of her photographs were often criticized in her lifetime. Yet she received numerous awards, (including a gold medal at Berlin in 1866) and honorable mentions at international exhibitions. A major development in her work came in 1866 with the purchase of a new camera that held large glass plates (11"x15"). This camera allowed her to embark on her singular large-format head studies. 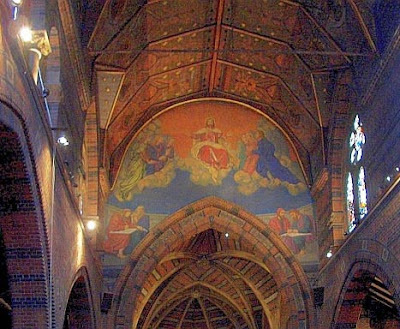 Mrs Cameron was devoutly Christian and over her fifteen-year working period, striving always to achieve high art and idealism, she produced many images portraying religious figures and illustrating sacred legends. 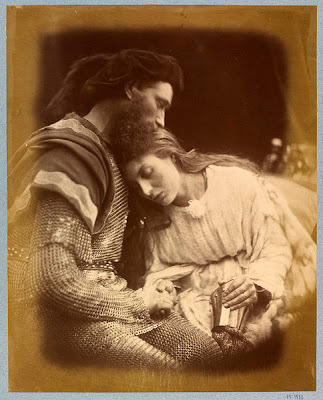 She was also interested in literature and poetry and produced two volumes of photographic illustrations for Tennyson's Idylls of the King, at the author's request. In October 1875 the Camerons left Freshwater and moved to Ceylon. Charles Cameron had purchased coffee and rubber plantations on the island, managed under difficult agricultural and financial conditions by three of their sons. 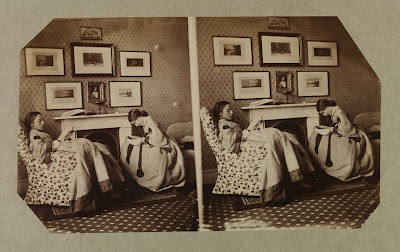 Mrs Cameron continued her photographic practice at her new home yet her output decreased significantly and only a small body of photographs from this time remains. 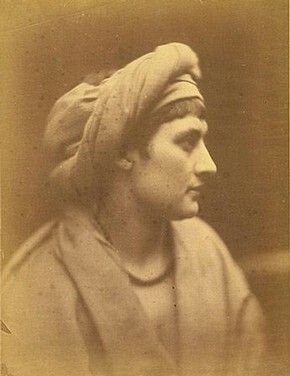 Throughout his life, Simeon Solomon regretted that he had never received a classical education, and consequently was not cognizant with Latin and Greek. But through his friendships with the poet Algernon Swinburne, the Eton schoolmaster Oscar Browning, and the Oxford don Walter Pater, the great critic of the Italian Renaissance, Solomon became deeply familiar with classical subjects. This watercolour may be related to a number of works he painted in the mid 1860s showing scenes of heterosexual, homosexual and lesbian love in ancient classical settings in Greece and Rome. 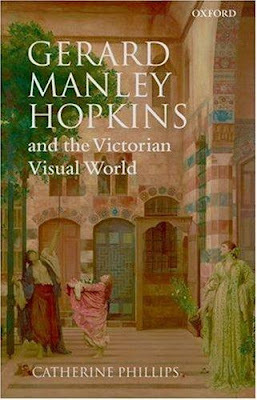 A student at Oxford during the years when John Ruskin and Walter Pater had great influence on undergraduates, Hopkins himself skteched and knew a great deal about the contemporary art world. Hopkins seems to share a great deal with the early Pre-Raphaelites who, following Ruskin, attempted to combine an extreme hard-edge realism with elaborate symbolism derived ultimately from habits of reading scripture common to both Protestants and Catholics.